Vackert två sovrum, två badrum (ett badrum och ett duschrum) lägenhet med utsikt över havet i ett välskött familjekomplex. Lägenheten har ett dubbelrum med badrum och svit och ett tvåbäddsrum. Lägenheten är öppen planlösning med en stor balkong med fantastisk utsikt över havet. Lägenheten kommer med alla moderna bekvämligheter (tvätt på plats) och är möblerad till en hög standard. Det har fyra pooler (inklusive en havsvattenrock), bar vid poolen, 24 timmars reception, à la carte-restaurang, snabbköp, dagliga aktiviteter vid poolen för vuxna och barn och underhållning varje natt. Även komplexet är bara en fem minuters promenad till centrum av Cala Egos stad där du hittar många restauranger, pubar och affärer. Kiddies road tåg stannar direkt utanför komplexet var 20: e minut och kan ta dig till centrum av Cala D'or. Komplexa faciliteter inkl. Tennis, bordtennis, minigolf, fotboll, full bar, biljardbord och barnens spelrum. Lägenheten är luftkonditionerad. För er som gillar lite telly, är lägenheten utrustad med Sky TV som tar emot en del engelska kanaler tillsammans med några kiddies kanaler samt. A bit noisy, but a great holiday nevertheless. We had a great stay in this appartment. The appartment is clean and the view is great. The area is also nice. We have only one thing that we think is important to be aware of before you book this appartment. During the summer there is entertainment in the pool area every night from 9-11. This is in french. Parts of it is pretty noisy, which makes it difficult to put children to bed etc. We found this tiresome, but others might not consider this to be a problem. We talked to the owner about this and he tried to help us as best he could, so we are very pleased with that. The hotel staff is also very friendly, and there is a lot of games etc. going on all day. Nous avons passé un agréable séjour dans le complexe , tout le confort pour une famille avec 3 enfants, l'appartement est spacieux et bien ventilé grace aux éoliennes dans les chambres et le séjour, les 2 salles de bains sont aussi bien pratiques , excellente vue sur la mer ou l'on peut admirer les bateaux passer, vue sur la piscine principale ... Les enfants sont très satisfaits aussi de l'ambiance du club et de ses animations et espèrent y retourner l'été prochain !!!! En plus, la plage est à 5 mn à pied . Nous avons loué une voiture pour visiter les environs mais sinon pas besoin car il ya tout sur place, les supermarchés, pharmacie, bars,taxis pas chers, ( 60 à 70 euros de Palma à l'appartement)....Superbe marché nocturne à ne pas rater ! Bref EXCELLENTES vacances à Las Rocas !!!! Just a quick review of this apartment in Cala D'or from which we had a very enjoyable stay just before Christmas. The complex and apartment were spotless.....altough place was very quiet at this time of year but that was what we wanted. The views from the balcony are absolutely breath taking, especially with the waves breaking on the rocks. The management company guy, Philip, was extremely helpful and called around within minutes when we couldn't sort out the heating so that was great. The apartment is only walking distance from the village as well so all in all we had a very relaxed and stress free holiday. A lovely week in a lovely place. Just a quick note to express our satisfaction with our recent stay in this complex. The apartment itself was very well presented and the views from the balcony are to die for. The balcony itself is also a sun trap from morning to evening. All the staff are very friendly with activities organised all day for the kids. Also the value for the all inclusive is incredible. I highly recommend this complex and apartment and will definitely be back again next year. We did not expect German standard, but we expected a clean apartment. The bedding had spots and we found two Silverfishes! under the quilt in the main bedroom! NONE of the beds were clean and the bedding/linen in the wardrobe had spots as well, same for the towels. We helped ourselves and luckily we could organize CLEAN and fresh linen from the hotel. We were not able to find 2 bedcovers for the quilts in the second bedroom. We were also surprised to hear that we have only 1 bath towel and 2 small towels for free per person during our stay of 10 days (this was not stated by the owner before). The bathroom fittings and toilets were not in a hygienic condition (corroded and mouldy). Toaster was rusty. The cutlery was partly rusty as well and not hygienic so we decided to book all inclusive in the hotel. One of the wooden sliding doors on the terrace could not be moved; there is no parasol for the terrace and the umbrella stand was damaged; both fans were rusty. All in all we cannot recommend this apartment. Rate is quite expensive for the condition. We took some pictures, but unfortunately we cannot publish them. 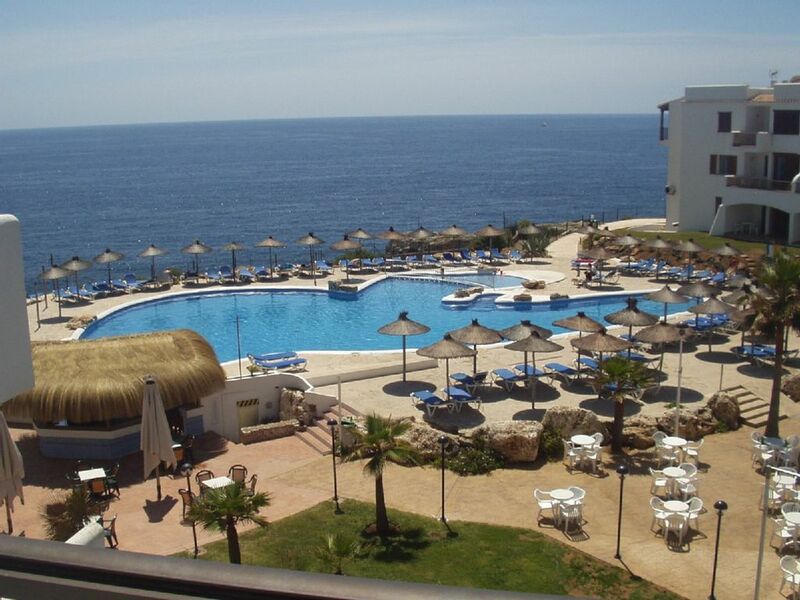 Description was accurate regarding the location which is very nice and has a beautiful sea view. I would just like to add a few owners comments in relation to this review. 1) This review is nearly two years old. 2) Whereas some of their comments were valid, we feel that others were not. However we must agree that in general the apartment was not up to scratch at the time. 3) Since this review, we have changed our management company, refunrished and painted the apartment and replaced all the items that were old or not presentable. We had initially asked our previous management company to do this for us as we are based in Ireland and therefore relied on their help in this matter. Obviously they did not follow our request and have now been replaced. 5) We can now assure everyone that the apartment is spotless, the new management company are only a few minutes away and speak perfect english should a problem occur, and we would ask that you view the pictures on the site which are now up to date. 6) We hope that this one bad , old review is not too offputting for you. Bara en uppdatering att en överenskommelse har gjorts under den kommande säsongen och efterföljande årstider med det engelska resebyrån Thomas Cook, så all underhållning i komplexet kommer nu att vara engelska baserat. Det finns också en tvåårig plan för att höja komplexets stjärnklassificering från tre stjärnor till fyra stjärnor så bra. Lägenheten ligger i Cala Egos området, som är en fristående stad med många affärer, restauranger och barer. Det är också två stora snabbköp (Spar och Eroski). Stadens centrum ligger bara 5 minuters promenad från komplexet så en bil är inte nödvändigt. Cala d'Or centrum själv är fem minuter med taxi (6 euro) och är full av restauranger, barer, affärer och butiker. För golfare bland er den närmaste kursen är mindre än 10 minuters bilresa bort med att det finns 25 banor totalt på ön. Cala d'Or är ett exklusivt, orörda område som passar par och familjer. Du kommer definitivt inte att finna gäng av rattfylleri tonåringar vandra på gatorna.